First Novels Club: How to network like a champ... even if you feel like a chump. How to network like a champ... even if you feel like a chump. Networking in such a huge mass of people intimidates me. Social/online networking is far more my speed. I've always gone solo to SCBWI events, both regional and local, and often feel I'd do much better if I had a group of friends, a critique group, etc. Starting conversations one-on-one, face to face, almost drowned out by the drone of 1,099 other attendees means I have to talk louder than I'd normally dare to speak with complete strangers. I save my loud "outdoor" voice for people I know well. By the end of Sunday I felt a bit more bold and did chat a bit with fellow autograph hounds snaking through the so-called party. A glass or two of wine may have sped up that process. If you have any tips for getting past that "I'm here, I'm alone, I want to meet you, do you think I am talking too loud"-ness, I'd appreciate your input! These conferences would be SO much more fun if shared. BTW, great blog, glad I found it! Thanks Kate! We're so glad you asked this question, because you're so not alone! There once was a time years ago when we hadn't known writing conferences existed. We were newbies in the networking realm, so we remember that intimidating feeling. We're all pretty outgoing by nature, which helped us when we were starting out, but we've also compiled some quick tips that anyone can use! They're pretty basic, but that's what's so awesome -- networking doesn't take an advanced degree! Successful networking is more about getting past the anxiety, and hopefully these ideas will help. 1. START WITH YOUR NEIGHBORS. Choose your location wisely when you walk into a room. Find an available spot near someone with whom you'd feel comfortable starting up a conversation, and then start one! The easiest thing to do is begin with, "Is this seat taken?" and then once you settle in, introduce yourself or ask them a question! Or when the session is over and everyone's readying to leave, comment on what you just heard. Caveat - If you're sensing the "leave me alone" vibe (or worse, the "I'm a complete weirdo" vibe), trust your instincts! At a conference, try someone new in the next session. Hint - You'll find it more difficult to continue a conversation if you let the silence linger after "Is this seat taken?" Keep the momentum going, and you'll bypass (or at least seriously minimize) that awkwardness. 2. EAT! DRINK! BE MERRY! In our experience, meal, cocktail, or hors d'oeuvres time is the best way to get to know people. It's a casual, relaxed environment, and strangers naturally sit near one another out of necessity. Don't be afraid to chime in on a table conversation. Caveat - Liquid courage is peachy in small doses, but if there's alcohol involved, don't get sloppy. 'Nuff said. If you're a frequenter of writing events (especially local ones), you're likely not the only one. If you recognize someone from a previous event, don't be afraid to say hi! The FNC first met Kim Sabatini at regional events in 2008, and most recently, Sara hung out with her at SCBWI NYC. Even a quick acknowledgment of, "Hey, weren't you at such-and-such event?" means you'll likely have someone to sit with or chat with next time. The name game: People tend to remember faces more than names. It's ok to politely ask someone to repeat their name, and be sure to offer yours. A hint for remembering someone's name: After you learn it, try to use it naturally three times in your subsequent conversation -- the repetition helps! The FNC loveslovesloves to adopt new friends at events. And in the past, we've been adopted! (One of our fave writer friends, Joanne, adopted Frankie years ago at a conference she was attending by herself!) Honesty works here. I promise you, if you admit to someone that you know no one, most people will be more than happy to take you under their wing and introduce you to who they know. Or you might discover that you've just met someone else who's alone! Voila! Alone no longer. Caveat - Ok, some people are miserable and weird, but if you stumble upon that one person who brushes you off, try again! Frankie with Joanne, who adopted her at a conference! 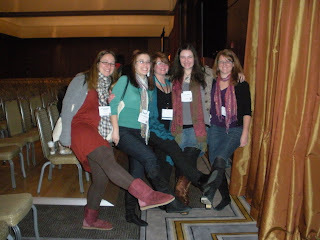 We've hung out with aspiring writers, NYT bestselling authors, agents, editors, publishers, and conference organizers. What do they have in common? They're all people. Seriously! Even if they're a celebrity in the book world, they likely don't see themselves that way. (And if they do, it's better to steer clear anyhow. Ego can be a dangerous thing.) Don't let fancy titles or awards intimidate you! Also keep in mind that, at conferences, people go to meet people! They're much more receptive to striking up a conversation than if you were, say, at the grocery store. The FNC having fun with Libba Bray, who is just about the coolest person ever. - For large events: This is a tough one, but the best recommendation I can give is to think small. You're in a huge, overwhelming room filled with hundreds of people. Where do you begin? Pretend that the room only has twenty people. Focus on just twenty people, and see who of those seems the most approachable. Start there. Get the gist of a conversation, then ask a question to join in. - Can you hear me now? Unfortunately, with regard to the voice volume required in such a situation, there's not much you can do besides aim for a quieter corner if possible. If you want to be heard, you have to speak loudly. Just remember that it's not loud or obnoxious to the other person --- it's just audible! BUT... WHAT DO YOU TALK ABOUT? Anything! But if you're stumped or feel like you're one step away from being a drooling, stuttering nincompoop, try these basics. - Ask questions! Begin with a general one, like, "Where are you from?" or "Is this the first time you've attended this conference/event?" or "What do you write?" People love talking about themselves, and if you're genuinely listening to them, a conversation can easily develop. - Don't discount the weather and travel. You can maintain at least a minute or two of conversation about the weather, guaranteed. It's the basic icebreaker for a reason! And people love sharing travel woes or stories, so if someone came from far away, they're bound to have something to say. - The situation. You're all attending the same event, so there's automatically something in common. Talk about what you're looking forward to, ask a question about something you're unsure of, comment on what's already happened. If you're looking to meet a specific person (i.e., an author, agent, editor), there's no harm in prepping yourself on conversation topics. Follow their Twitter feed or read their blog, and see if anything jumps out at you. Having a general sense of who they are will help them feel more familiar to you when you meet them! Hint: Know what they look like ahead of time! It's easy to find a headshot online, and even if it makes you feel like a stalker, it's much less creepy than leaning in closely to read people's name badges. If you desperately want to meet an agent/editor because you want to query that person, don't feel obligated to start off the conversation with a pitch. Agents and editors are ASSAULTED with pitches at conferences, so it's a breath of fresh air if, say, you talk about how you both grew up in the Midwest or studied abroad in Australia. If the conversation leads naturally into a pitch, then let it. But if it doesn't, you now have an excellent, personalized intro to your query letter! "I had a wonderful time talking with you about Australia at Such-and-Such Conference. I loved reliving my study abroad experience, even for one afternoon." Suddenly you're no longer a random letter; you're a person. Ramble on and on about yourself/your book/your cat. No monopolizing the conversation! Insult others -- conference-goers, authors, speakers. Follow someone into the bathroom (especially if it's an agent/author/editor). And schmoozing is never attractive. Insert yourself into a personal conversation, or force someone to leave a conversation to address you. If you meet someone, exchange business cards, email addresses, Twitter handles, or blog URLs. When you get home from the event, don't be afraid to send them a quick message telling them how nice it was to meet them. Don't let the end of the event be the end of your networking! Be yourself, because you're awesome. One of the biggest mistakes you can make walking into a networking situation is to think you're not worth knowing. No matter the situation, you have something to offer! When you step into an elevator on onto an escalator on your way to the event area, say hello or good morning to the person already there. Smile! Make eye contact with people you pass in the hall, or the person in line beside you at the buffet. If you seem friendly, someone might strike up a conversation with you (and save you all the effort!). All of this might lead to a bunch of four-sentence conversations that go nowhere. That's ok! Not every effort you put out will result in a new friend. But some will, and the more times you try, the easier it gets to break the ice. And one day, you might be the person adopting the intimidated newbies, showing them the ropes. Good luck! Ok everyone, help me out, because I'm bound to have forgotten things! What are your tricks to networking at events? How did you get over your networking anxiety? Any other questions for the FNC? Leave it in the comments! So I totally followed author Mariah Fredericks into the bathroom at the NYC Book Fair years ago, got her email, and asked her out to coffee. She was so nice. In my defense I really had to pee. We coincidentally had our urges at the same time. This is now TMI. Kathryn - No problem! Glad you found it useful! Sophia - Hahahaha there are always exceptions! The bathroom thing is primarily if you're following an agent into the bathroom and are pitching them through the stall door. We've spoken with many agents, and it's happened! Thanks for the tips! Being intimidated by the large numbers of people and the fact that I won't know anyone is what keeps me from getting out to a conference! I need to get over my fears! Great advice. I've learned at regional events where I've gone alone to just meet people. But I have to admit a national SCBWI conference would be intimidating. Great advice to have someone adopt you. Social anxiety is a problem for me, in and of itself. The icebreakers are the ickiest. I think I overthink my thoughts too much. Analyzing every drop that sputtles from my mouth. Especially when projected toward a strange face. I get the heebeejeebees just listening to myself. Let's follow this post up with, "How to network... without giving off that WEIRDO vibe."